On Episode 204 of CrossFit Radio, host Justin Judkins looked back on 2011 and played excerpts from interviews with well-known CrossFitters such as Matt Chan, Rich Froning Jr., Leah Polaski and Amber Wilson. Justin also interviewed CrossFit Evolution owner Monique Ames. This episode was webcast live at 6 p.m. PDT on Wednesday, Dec. 28, 2011. The WOW (Workout of the Week) is from CrossFit.com. 0:50 Justin read a post from Lisbeth Darsh titled “Holiday Advice You Didn’t Ask For.” He also reflected back on CrossFit Highlights of 2011 and played parts of interviews with Matt Chan, Rich Froning Jr., Leah Polaski and Amber Wilson. 20:40 Monique Ames is the owner of CrossFit Evolution. She came on the show to talk about lessons she has learned as a business owner and how she’ll approach the New Year with those lessons in mind. She gave advice to her fellow affiliate owners so they can start 2012 on the right foot. 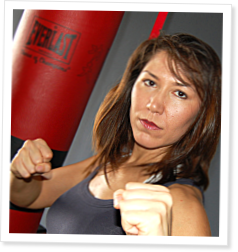 Sharing her knowledge, Ames explained why she doesn’t allow drop-ins at her box, as well as how she promotes the right kind of culture and integrates new clients into normal classes. Ames recently had Original Firebreather Greg Amundson do a goal-setting seminar at her box, and she shared what she took away from the seminar. Monique is a great Athlete, Coach and Leader. Thank you Monique for all that you do for the CrossFit Community! - Greg. Good interview with Monique, sounds like she has a great box! But I have to take exception to the no drop in policy. If I misunderstood and she does allow drop ins by experienced CFers, then never mind. I can completely understand a no walk in policy, but a no drop in policy? Are her members not allowed in other boxes when THEY travel? I learn something new at every box, and I've had quite a few trainers ask me what other boxes are doing well once they find out I've been to a lot of boxes. And it is common for me to recommend the box to friends/relatives/people living in the city where I drop in. Just wish you would have challenged her a bit on that, JJ, because I don't understand it. Again, if I misunderstood her policy, never mind.